Karabiner Access (KA) introduced rope access to Australia. Our reputation for innovation, functionality and results is unparalleled to any other provider. We design and install systems to enable access to high level internal and external facades via industrial rope access. We will deliver what you want, which is a compliant, safe, functional and cost effective solution in sympathy with your architectural outcomes. 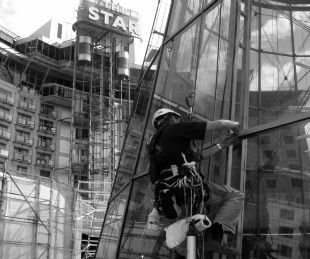 While there are reliable, industry standard systems on the market, many structures require specifically designed industrial abseiling and anchoring solutions and this is where we excel. Scope: Design, supply and install replacement installed access systems for internal and external voids.